There is something strangely alluring about old houses. Beyond the tattered, crumbling façades, stories of time and place reside between old walls, echoes of yesteryear, tangible reminders of local history. Such is Shakesides, an ailing relic set amongst the forest on the shores of Comox Estuary, home of the late Hamilton Mack Laing. Made from a kit home in 1950 by Laing, Shakesides has weathered more than 60 winters and now it sits at the epicentre of perhaps its most turbulent storm yet. A structure worth keeping, worth the time, money and resources to maintain it and allow the visual story of Mack Laing to organically unfold? Or is the relic an increasingly dangerous ‘eyesore’, beyond repair, an irrelevant, derelict, and unnecessary structure, and void of the necessary resources to mend and maintain it? The cedar roof shingles of Shakesides are peeling and layered in moss and lichen, the shingled side walls brown, faded, tired. Various plants and vines have interwoven themselves up and across the outer structure, entangled, roaming uncontained. Several windows are boarded, venetian blinds hang lopsided from inside the front room. On top, two loft windows with small triangular roof panels watch down over the house and the vast foreground beyond like the old eyes of an ancient owl. It evokes an image of a figurative guardian of the land. But the owl’s window-paned eyebrows are cracked and peeling too, and in desperate need of care. Even the boardwalk, which winds its way right in front of the dwelling, has seen better days. Unruly weeds grab at the feet of passersby as people stop to embrace the scene before them, both man-made and natural. To stop and look across the tidal waters of the estuary brings into clear view the Beaufort Range, a vast green blanket of growth with its stark ridgeline silhoutte traversing the sky. To the right, the Comox Glacier shines down, glowing bold, white, majestic. It represents a stunning vista, a panorama so magnificent that one simply cannot resist to stop and stare. Two hundred metres from Shakesides, also on the estuary and surrounded by trees and abundant birdlife, is the site of the former Baybrook house, Laing’s first Comox home, constructed in 1923. Baybrook lived numerous iterations, having been sold to a local family in 1949, and then again in 2006, but where the structure sat for close to 95 years is now rubble and a solitary cement slab, left by demolition workers following orders from Comox Council. In the early hours of August 2 of this year, a giant, mechanical claw put a sudden, confronting end to this part of Comox’s history, sparking a heated debate that continues to gather flame and fury. Finger pointing, accusations, and blame have enraged the issue; of blatant disregard for Laing’s will, wanton destruction of a natural heritage zone, name calling, slander, lies, bullying, outright arrogance and ignorance, and even identity misrepresentation. Born in Huron County, Ontario, in 1883, Laing’s family moved to Manitoba and settled on a dairy farm in Clearsprings where he became a keen hunter and observer of nature. Educated locally, he moved to the Winnipeg Normal School in 1898 and in 1900 he qualified as a rural school teacher at the age of seventeen. A gifted teacher, he taught his students nature study, helped introduce the Scouting movement to Manitoba, and in 1908 was made principal of Oakwood High School at Oak Lake, where he remained until 1911. In 1905, he earned a diploma in story writing from the National Press Association of the United States, and his first published piece of fiction was The End of the Trail, published in 1907. In 1920, he decided to return to Canada. He chose Comox—described to him as ‘a very birdy place’—and in 1922 cleared his land with little assistance and built his home from a Stanhope Aladdin Ready-Cut kit. 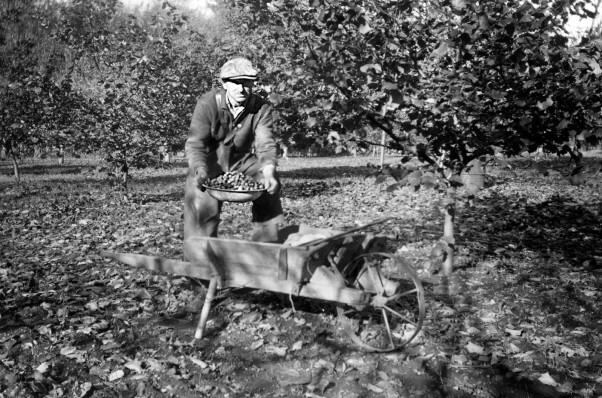 Five years later, he married Ethel Hart of Portland and together they established a successful commercial orchard—Baybrook Nut Orchard—which included walnut, pecan, filbert, hazelnut, apple and plum trees. They also grew mushrooms and an assortment of vegetables. In 1944, his wife Ethel died of cancer after a short illness. Laing was devastated. 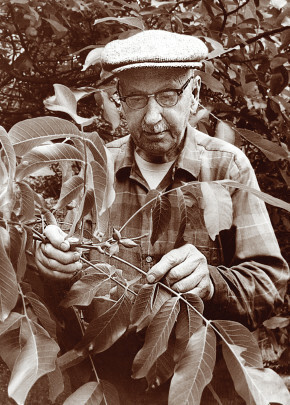 In 1949, he sold the Baybrook property and orchard, retaining four acres along Brooklyn Creek, and in 1950 he built Shakesides on the adjoining lot, in what is now Mack Laing Nature Park. Laing was an avid photographer, taking many photos of local wildlife, scenery, people, and the work done on his land. He kept detailed diaries and observation notes. His reputation as an expert on birds flourished during these years. He had many visitors during this time, including fellow naturalists, artists, hunting and fishing companions, and writers. Over his lifetime, Laing published more than 700 articles, 22 of which were featured in scientific publications of his day. His works were described as a “delight to read.” Additionally, Laing collected more than 10,000 vertebrate specimens in his lifetime, the majority for the National Museum in Ottawa. Throughout the 1950s and 60s, he continued to study, write and photograph with fervor, and in 1973 he bequeathed his Shakesides property to the Town of Comox. He continued living in the house until his death in 1982 at the age of 99 years. A plaque erected in 1983 in Mack Laing Nature Park reads, “he gave his home and land to the Town of Comox, in trust, in perpetuity, for conservation and to encourage appreciation of nature.” Laing’s will stipulated the preservation of Shakesides—his second home—as a nature centre, and provided $55,000 for its maintenance. According to Comox Mayor Paul Ives, this fund is still safely stowed in council coffers, but the suggestion by some that this amount is equivalent to about $300,000 in today’s currency has little merit says the Mayor. Ives claims the actual amount to be somewhere closer to $75,000. In 2009, the Town of Comox, working together with the Nature Trust of British Columbia, purchased three parcels of neighboring land—including Baybrook—for a little more than $1.2 million. “We did that to add to the green space,” says Ives. “We have essentially doubled the size of Mack Laing Park.” Then, soon thereafter, on the back of official property assessments undertaken by both a professional structural engineer and architect, the Town of Comox declared that Shakesides was structurally unsound and was therefore to be demolished. Regarding Baybrook—named by Ethel Laing as a place where Brooklyn Creek meets Comox Bay—the same assessment concluded the structure could be carefully rehabilitated and adapted to a new public use. Nonetheless, council were concerned about safety issues and the possible burden on local taxpayers to foot refurbishment and maintenance costs. After lengthy discussions, they made their intentions public; Baybrook, too, was slated for demolition. The Mack Laing Heritage Society (MLHS)—a small, local, volunteer body created to ensure the legacy of Laing—rallied behind these findings and urged the Town of Comox to preserve Laing’s original dwelling, Baybrook, as a nature centre in lieu of Shakesides. The MLHS got a legal opinion that the Town should transfer its trust from Shakesides to Baybrook. The society also got the support of various heritage agencies, provincial and national, voicing their support for the preservation of Baybrook. Interestingly, they also learned, and confirmed, that part-time Comox resident Alice Munro had spent several months at Laing’s former house. Additionally, according to the MLHS, Heritage BC offered to assist with restoration costs to the tune of $150,000 and that other sources of funding were available to offer viable, cost-effective preservation options. Mayor Ives was quoted by the Comox Valley Echo on August 11 as saying, “They just said funding might be available,” suggesting the funding was far from guaranteed. Despite impassioned pleas from the MLHS and Canada’s most prominent heritage agencies, in February the decision to demolish Baybrook was upheld and early on the morning of August 2 the order was carried out. Despite several angry and frustrated protestors, the big rigs rolled in. In his own defence, Mayor Ives says, “We need to step back from the emotional side and start to work together.” He added that the Town of Comox respects the heritage value of the Mack Laing area, and has, as a rule, embraced green space. “Just look around our town and see the good work that’s been done,” he said, highlighting numerous local parks and forested areas, including Filberg Park, Marina Park, and the North East Woods, as natural areas of council focus. What about old houses, then? Are they simply feeble, irrelevant shacks of a bygone era, serving no purpose and yet requiring dollars to keep erect? Would Hamilton Mack Laing, as a naturalist, have been so unforthcoming to the idea of having his former houses felled and in their place, perhaps, a pavilion offering up information, pictorials, quiet surrounding trails, a place to sit and appreciate the birds and the local scenery? Mackie, having lived in Shakesides for three months immediately following Laing’s passing in 1982, says he thinks he knows the answer. The furore over Mack Laing’s houses rages on with no end in sight. Both sides are bracing for more action. Meanwhile, as if oblivious to it all, the sun rises and falls on the vast Beaufort Range, the Comox Glacier sits high and proud, the tides at Comox Estuary ebb and flow as they’ve always done. Birdsong is all around. Nothing much has changed in this regard since Mack Laing heaved hammer and hoe in this same spot more than 90 years ago. Shakesides, with its alluring beauty and ancient owl eyes, rests peacefully. For now.